Made available by us is an unparalleled range of Spiral Classifier that is fabricated using high-class raw-material procured from trusted vendors of the market. The seamless tubular shaft fitted in this classifier is made from heavy duty cast iron that provides minimum deflection and is submerged in a special housing provided with multi layer labyrinth and oil seal protection. Offered range is tested by our skilled professionals on parameters of quality such as finish, design, speed and others to provide a defect-free range at the customers' end. 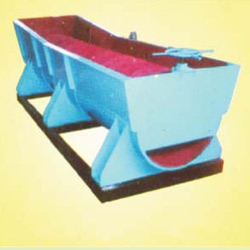 With the help of our highly skilled & creative experts, we have been able to manufacture and export a broad range of Spiral Classifier that is specifically used to separate sand from liquid crude china clay. These products are available with us in variety of sizes, models, grades and other specifications to suit the varied requirements of our prestigious customers. Precisely-engineered at our technically updated and well-equipped manufacturing unit, this range is offered at very reasonable prices. Looking for Spiral Classifier ?